When I was younger, I despised tomato soup. The flavors never seemed to call for me, nor did I ever crave grilled cheese. My favorite was Mom’s chunky beef stew that simmered and bubbled on the stovetop for hours in our small yellow duplex kitchen back in Minneapolis. It wasn’t until high school that I began to crave the comfort of creamy tomato soup after Mom started buying Progresso’s hearty tomato. 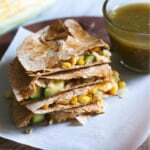 In fact, I remember us making cheesy pepper jack quesadillas and canned tomato soup on a frequent basis. Mom worked a lot to support our family and during my teenage years, the two of us didn’t have much time to enjoy meals together. Quick and easy was exactly what we needed. Today Tony and I still buy canned or boxed soup. We have nights where we’re depleted of energy and need something quick and easy to nourish ourselves. Even though I have a food blog, it doesn’t mean I’m making dinner every single night. Sometimes my days are focused around baking, snacks or breakfast, and by the end of the day the last thing I’m thinking about is what to eat for dinner. However, when I do have time to make a good tomato soup, I get a little giddy inside. And since it’s finally tomato season, I couldn’t help but present this beautiful bowl of homemade roasted tomato basil soup to you. Now, let’s talk about this soup and what I used to make it incredibly flavorful. Roasted tomatoes: Roasted the tomatoes helps them to sweetened and slightly caramelize leading to a sweet, rich tomato soup flavor. You can use either roma or plum tomatoes. I recommend using garden fresh or organic to keep the soup as flavorful as possible! Roasted garlic: Let’s not forget about how delicious roasted garlic is. The sweet, lick your finger good flavor is essential to this recipe — and it’s easy to roast right alongside the tomatoes. Fresh basil: Basil has a slightly sweet flavor and should be added to the recipe before serving, as too much heat can remove the flavor of it and sometimes turn it slightly bitter. This herb also helps to cut the acidity of the tomatoes. Caramelized onions: This was one thing I did that was a little different was addition of caramelized onions! The sweet onions are caramelized, then blended into the soup. AMAZING! Optional add-ins: I’ve included optional ingredients that you can add to the soup to make it your own in the ingredients below! If you’d like, this is your chance to get a little creative. Just look at the color. Simply gorgeous. I like to top it off with shaved or grated parmesan cheese and a little extra basil. Of course, you’re more than welcome to make a grilled cheese sandwich to go with it. My favorite lately has been sprouted bread, pepper jack, turkey, spinach, sliced tomato, dijon mustard and a drizzle of honey. SO GOOD. Homemade roasted tomato basil soup with garlic, olive oil and caramelized onions. Delicious, flavorful and the best way to use up garden tomatoes! You'll never want to go back to the canned stuff after you try this. Preheat oven to 400 degrees F. Line a large baking sheet with parchment paper. 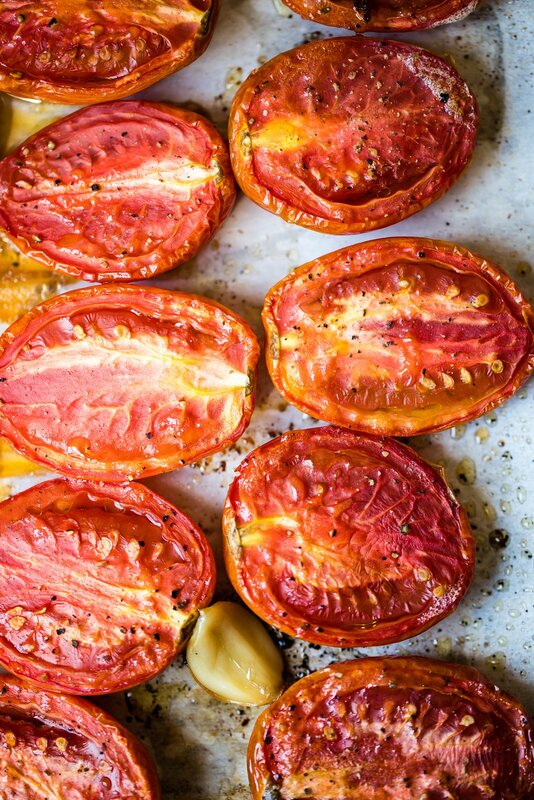 Place halved tomatoes and garlic cloves on the baking sheet and drizzle with 3 tablespoons of olive oil. Generously season with salt and pepper. Roast in the oven for 40-45 minutes. While the tomatoes are roasting, you can make the caramelized onions: Add 1/2 tablespoon olive oil to a large pot and place over medium heat. Add the onion slices and stir to coat the onions with olive oil. Cook, stirring occasionally. Check onions every 5-10 minutes until they have completely caramelized and turned golden in color. This ususally takes 20 minutes. 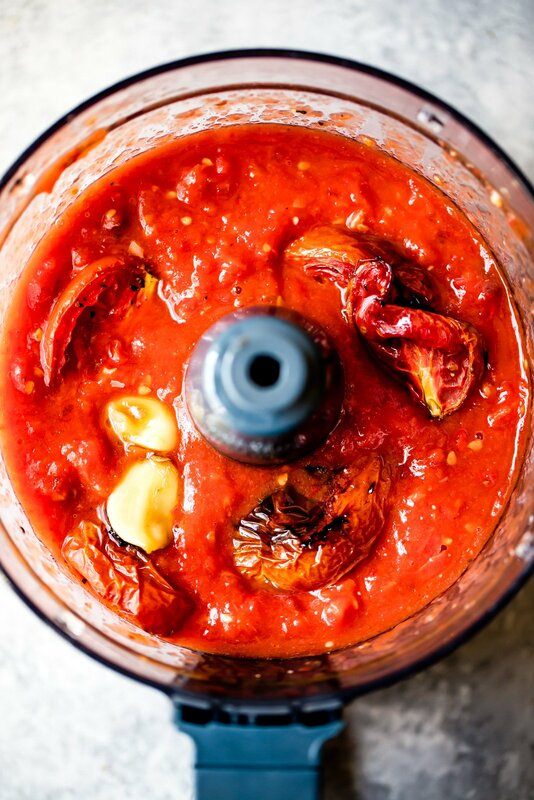 Once tomatoes and garlic are done roasting, allow them to cool for 10 minutes, then add them to a food processor or high powered blender and blend until smooth. Next add basil and caramelized onions and blend again. Alternatively you can add the tomatoes to the large pot and use an immersion blender. It's really just about what you have available to you. After blending, transfer back to pot, turn to medium low heat and add in oregano, vegetarian broth and salt and pepper to taste. From there you can add in any additional add-ons you want (as listed in the ingredients). Allow tomato soup to simmer 10 minutes before serving. To serve, garnish with parmesan cheese and serve with grilled cheese, if desired. Serves 4. I do not ususally strain the seeds, but you can with a fine mesh strainer if that's what you prefer. 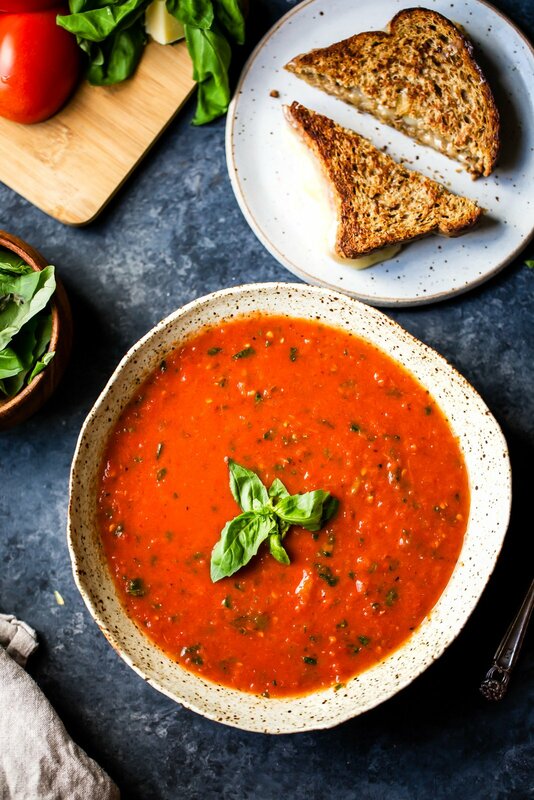 185 Responses to "Homemade Roasted Tomato Basil Soup + video"
This looks seriously PERFECT!! Love this tomato basil soup recipe!!. This was a great dish. I made it especially for my family and the whole family enjoyed it. It is definitely worth trying, and I will be making it again. Before this, I made Russian Salad Recipe from one of best cooking website sharing a link with you: ( https://www.sooperchef.pk/russian-salad-recipe/ ). 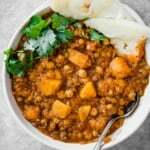 I just tried this recipe and it is a great combination of wonderful fresh ingredients. Unfortunately the tomatoes I used weren’t as juicy and rich as those in your recipe. So I added a bit of red pepper flakes to add character to it and finished it off with a dollop each of sour cream and basil pesto. That did tre trick. Next time I’m shopping for the best organic juicy tomatoes I can find. Thanks for sharing this great recipe! I am not a fan of tomato soup … well I wasn’t unti now. Made it tonight with grilled cheese sandwiches. It was delish. I added a bit of heavy cream and grated cheese. My kitchen was a disaster (I am a disorganized cook) but the soup was delicious. Love this with grilled cheese. Glad you enjoyed! Your roasted tomato basil soup truly seems to be delicious and flavorful. Thanks for sharing this recipe. So great to hear! The caramelized onions add a delicious flavor. 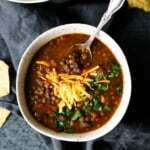 One of my favorite soups ever! Thanks for sharing! You should definitely try this one!! Is it ok to freeze after making this? if so, how long would it last in the freezer? what about canning the soup? Would that work well? Soup is not my thing, but tomato soup, especially one like this is totally something I could get behind. Also give me ALL the grilled cheese! Roasted tomatoes in soup taste WAY richer than raw tomatoes–but that is just my opinion! This will definitely taste fantastic with some whole wheat toast! Agreed! And yes some toast on the side would be delicious. Ahhhh!!! This looks absolutely amazing!! 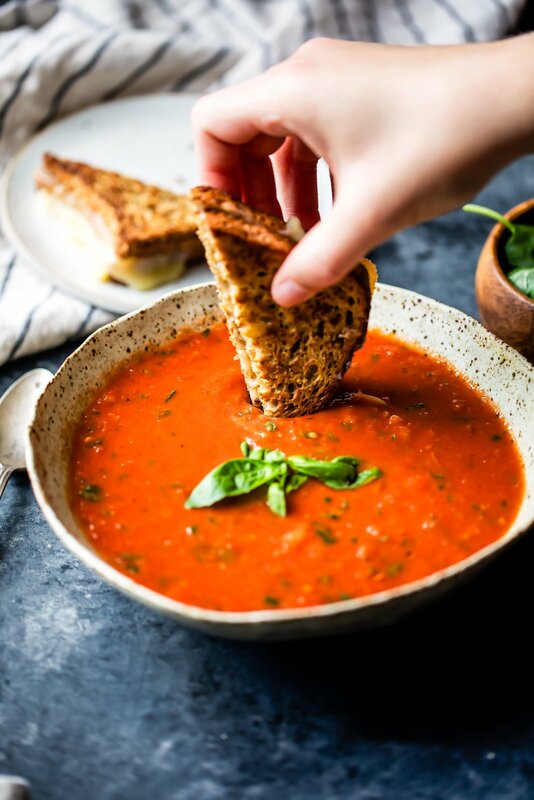 I have been craving a tomato soup that is dairy-free (and while I love coconut milk, I don’t love coconut milk in everything….). Adding this to the list for next week!!! My husband LOVES any excuse to eat a grilled cheese sammy with dinner. This turned out delicious! I added just a little of crushed red pepper for some heat, and my husband and I love it! I just made this and I am halfway through my first bowl. Very good! I Used your base recipe with no add-ins and I see no reason to mess with it in the future. I baked some Old Bay biscuits, the kind they serve at Red Lobster, and they were fantastic aside this soup! Thank you. We made this for dinner tonight & it was fantastic! Great way to use the abundance of tomatoes from the garden! Just made this. It is ridiculously good. Thank you for sharing! I’m with you- totally hated tomato soup as a kid! Now that I’m older I’ve fallen in love with it! I can’t wait to give this recipe a try this weekend! I made this last night and my whole house still smells like caramelized onions hahaha – and I’m not complaining! This tastes fantastic!! Even without the little bit of half & half I added in, it was still so creamy! My fiance loves tomato soup, especially from Panera, and we both agreed that this exceeded theirs! It’ll definitely by a staple during our cold Chicago months! 🙂 Thank you! I made this today to can for my daughter who is away at college. She loves tomato basil soup! Only thing I added was some sugar to cut the acidity. Delicious! Do you add a full can of Coconut milk? I made this for dinner tonight after searching for recipes to use some of my garden tomatoes and basill. In lieu of broth or water I put a can of coconut milk to make it creamier. My fella ate two huge bowls, yum! This is the best tomato soup I’ve ever had. So delicious! Roasting the tomatoes and adding caramelized onions makes this soup amazing. Thank you so much! would this soup work well for canning? It sounds deelish, and will definitely try it! Hi Cathy! I haven’t tried canning it before, so I’m not sure how the properties in here will hold up! could you tell me please how many cups this recipe yields ? and also i don’t have a scale would 3 pounds of tomatoes equal about 6-8 med size tomatoes? thank you. I look forward to making this! 3 pounds is about 20-24 roma or plum tomatoes! This recipe serves 4 people and should yield about 8 cups. I am so happy I stumbled upon your recipe. I picked the last of my tomatoes this week and was looking for something to do with them besides canning pasta sauce. I made the soup today and have enough left to freeze a few pints to enjoy this winter. Absolutely delicious! I would give it more than 5 stars if I could. Amazing! This is the perfect recipe for all of those fresh tomatoes 🙂 so glad you found it! Made this tonight….well roasted the tomatoes and caramelized the onions last night….threw it together and blended tonight……soooooooo yummy!! Can’t wait to try some more of your recipes!! Delicious – hope you enjoyed! The sprouted bread looks lovely. Do you make it? Do you peel the tomatoes after roasting them? Tasted really good although seemed to have a rather strange gritty texture. Very strange – I’ve never noticed that! Oh my gosh, this is good. Made it last weekend, and had to make it again for this weekend. Added a pat of butter, a pinch of brown sugar, and a dash of heavy cream. Tons of flavor! It’s just delicious! The best tomato base soup, thank you for sharing! Delicious! Seriously amazing. Best tomato soup I’ve ever eaten. Explosion of flavors. Secret ingredient is the home grown tomatoes. So happy to hear that! And absolutely – can’t do much better than home grown tomatoes! I just made this. So good!! I felt like it needed SOMEthing and decided to add 2 tsp Anchovie Paste. Perfect!! Thank you for this recipe! It’s going in my box!!! and carmelized a chopped red onion. And it was creamy with some chunks from the sun-dried tomatoes and out of this world delicious!!!!! Fabulous!! So glad you enjoyed! Can you make the Tomato Basil Soup with canned tomatoes? The garlic, onions, and basil along with the other ingredients I can manage this time of year. But garden fresh tomatoes i can’t make magically. Or could i use my homemade V-8 juice? If you can grow it, its usually in my V-8 juice. This looks amazing and I’ve craved it for 2 days. Thought i had some last night, and today, getting out ain’t happening! Ice with snow on top! I wouldn’t recommend using canned tomatoes, and would roast up some fresh tomatoes if possible (even if they aren’t romas!) Hopefully the ice + snow melts for you soon! Made this soup yesterday for 14 people. It was a hit! That, BTW, is an understatement. It was think and delicious and the perfect start to a vegan dinner. Next time I’ll try it as a cream of tomato soup but it seems perfect without out anything but the tomatoes, onions, basil, a bit of oregano and salt and pepper. Thanks. I’m so glad everyone enjoyed it! This one is great as-is, but perfect for adapting to your taste preference (I added some suggestions to make it creamier, etc. in the recipe) Enjoy! Amy, I can’t wait to try this soup…it looks amazing! Would you mind sharing where you found your speckled pottery soup bowls? They’re beautiful! It’s so delicious – I hope you get a chance to try it! And I go these soup bowls from a friend 🙂 I’ll let you know if I find a link! Can you say WOAHHHH this is now my go to for a healthy, fast, and easy meal! I was looking for something that was easy natural and no canned good! This one hit the SPOT! I absolutely love this soup! I’ve made it twice, and I’m going to make it again today! It is the perfect recipe for tomato soup! Love love love!! I do add parm and basil per your recommendation and it’s easy and flawless! 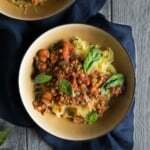 I’m a new fan of you, your recipes and your blog! I’m so happy to hear that, Christine! Parm + basil sound delicious in here. Welcome to AK, too – so happy to have you! I made this for dinner last night and I love how easy it was to make but it still had all the flavors! I do a lot of reading before deciding on a recipe, and it’s pretty rare to find one that uses all fresh ingredients. The difference is clear, though, MAKE THIS ONE! The only changes I made were adding some nutritional yeast for a cheesy flavor and I served them in homemade bread bowls (double yum!). Thanks for another delicious recipe! I can’t wait to keep trying more from your website; they never disappoint! So happy to hear that Hannah!! Also those bread bowls sound amazing. This soup is no joke- like seriously the BEST tomato soup recipe ever. You weren’t kidding when you said it’s better than Campbell’s!! I used sweet onions instead of yellow onions and it was amazing. Made this tonight by tweaking it to serve one.. it was delicious! Didn’t have any basil so I just skipped it. Used some coconut milk at the end. Yummy! Perfect! Love the coconut milk. I made this soup today and it was excellent! I roasted some thinly sliced eggplant while roasting the tomatoes and chopped a few slices to add as a garnish. Also added chopped avocado. Oh my goodness! Delish!! I made this last night AND this morning and OMG!!! Last night I used plums, this morning romas and I like it better with the romas. I did add the butter to last nights batch and while it was delicious, I really think this recipe is fantastic as is! The only change I made was 2 heads of garlic as opposed to 8 cloves as my heads were small. Oh and I may have been heavy handed on the basil 😉 but I mean….it’s basil! C’mon! Lol. Absolutely loved this and it has now been added to my binder!! Amazing!! I’m all about extra garlic + basil in here 😉 So glad you loved this one Holly! I have just made this and WOW it is incredibly DELICIOUS!! Followed your recipe, and the only change was, I used a chili chicken cube as that was all I had – it was still amazing but next time I will use the chicken. The flavors in this sound amazing!! It is a bit warm in AZ for soup right now, but definitely going to save this! They’re seriously incredible! You’ll have to give this a try once the temps cool off a bit 🙂 Enjoy! The restaurant I work at features this amazing roasted tomato basil soup on their menu. 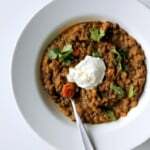 But this soup looks SO fresh and vibrant–I absolutely love the fact it includes caramelized onions and chunks of basil and oregano! And grilled cheese with the soup? Can’t think of a more delicious combination! SO great! 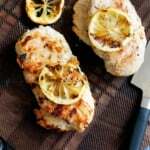 Since finding your site, I’ve made every single recipe you post. Haven’t had one that I wouldn’t make again. So wonderful!!!! 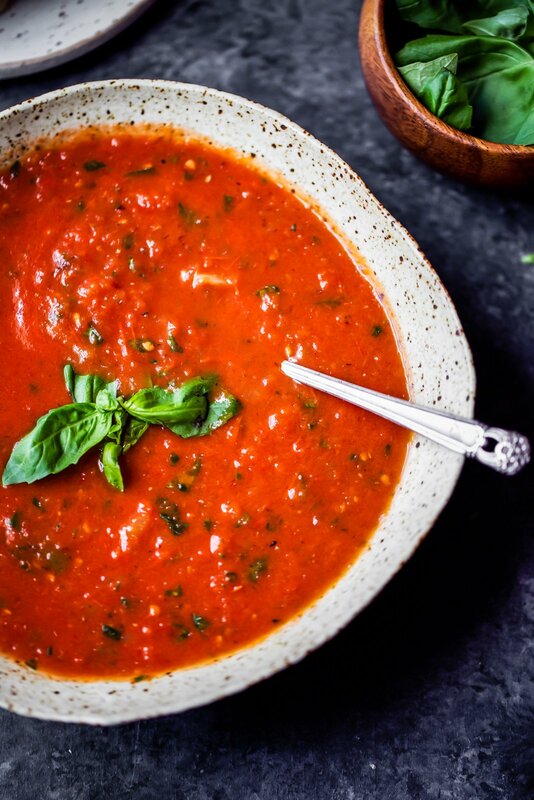 This roasted tomato basil soup is fabulous! I just finished making it and it tastes so fresh and delicious. It is so easy to make, I can’t wait for more tomatoes to ripen to make another batch! This has become my favorite way to use our abundance of tomatoes and basil. I doubled the recipe. It made three quarts. I have them in the water bath canner at the moment. This soup is delicious! I hope my green tomatoes ripen soon so I can make more. Super easy too! Please let me know how it turned out after canning. That is what I am planning on doing. I never review recipes but i love how simple and amazing this is. I use what ever tomatos are ripe and ready in my garden the more verity the better i alway include some cherrys and 1 bradywine and whatever i have its so so good. I found the roasted tomato base with the blended onion is so delicious i use it as a start to pizza sause spaghetti and penne vodka it has changed my world i freeze that part and make anything from there. I made this soup and we love it!! My husband isn’t a big tomato soup guy but couldn’t stop eating this. It’s easy to make and such rich flavor! Thank you!! So happy to hear that! The flavors in here are a game-changer 🙂 Enjoy! Seriously….. whyyyyyy have I been using my food mill my whole life?! This is sooo much easier to blend the roasted tomatoes up with a stick blender! Wow I can’t tell you how happy I am with my tomato soup this year. It’s going into the freezer in jars with the other batches I did! Perfect! Glad you found this recipe + these tips! Cani prepare this the day before? Fantastic recipe. Making my second batch today. Never been a huge fan of tomato soup but this one is delicious. Sharing! I bought 3lbs of vine ripened tomatoes recently, ‘cos they were on sale, and roasted them first with olive oil, s&p, balsamic vinegar and a sprinkle of sugar, then I looked for roasted tomato soup recipes, and stumbled upon this one. I did seed and peel the tomatoes, but next time, I won’t bother. I like my soups fiber rich and chunky. Other than the slight difference in roasting technique, and the above, I made the soup as per the recipe, adding fresh basil, a little heavy cream, and some Parm-Reg cheese. It was fabulous! I ate all of it myself in two meals. I will make this over and over again. Amazing! So glad you enjoyed, Rachel. This was absolutely delicious!! My husband loved this. I used vegetable broth, but left out the coconut milk. It didn’t need it. I did add a little pecorino cheese on top and it really made the flavor pop. I love the that I now have something I can confidently serve my vegan/Vegetarian friends. The only thing I would try to do differently is to take the skin off the tomatoes. I did not like the mouth feel of the little skin pieces. I used an immersion blender to mix. Would a blender do better? Love a little cheese on top! Perfect recipe for your veggie friends 🙂 I typically use a blender but an immersion blender should do the trick. Just delicious! I also roasted 2 red peppers with the tomatoes and garlic. Plus seasoned these with dried thyme. Also added fresh parsley with the fresh basil. At end added a pint of half and half. Just fantastic! Will be bringing to my father who turns 90 today! Thank you so much! I made this soup today and i REALLY had to doctor it up. Added a whole 48oz carton of vegetable broth, at leadt a half of can of tomato paste, and ton more salt and pepper as well as garlic and onion powder. I did follow the recipe word for word. I’m not sure whether the roma tomatoes were just flavorless or what but without my add-ins, i don’t know whether i could eat it. Husband totally agreed. Hi Brandy – it sounds like the tomatoes most likely were not in season or not ripe enough. With flavorful roma tomatoes this soup should be perfectly delicious as-is! OMG!! This is the BEST tomato soup I’ve ever had!! I made it exactly as written. Thank you SO much!! I love your recipes. Delicious,simple and useful ! Thank you so much ! I just made this soup I know not the best time of the year for fresh tomatoes etc but I had such a yearning for something fresh. It tastes amazing but it’s not the lovely red colour, I would say it’s a kind of light brown, not particularly appetizing looking😔 what did I do wrong do you think. Glad it tasted amazing! The color depends on the tomatoes. Because they’re not very in season right now they just won’t be as red 🙂 But the soup will still be delicious! I make broiled Roma tomatoes to get a slightly charred surface plus broiled fennel (instead of onions) plus garlic, oregano, a teaspoon of tomato powder and chicken broth. Garnish with dried basil and parmesan. Toasted cheese sandwich in an iron skillet tops it off. 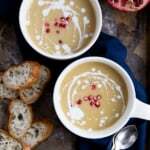 The recipe says that one serving (one-quarter of the soup) equals 275 calories. Any idea how many cups in a single serving? I’m not quite certain but I would assume about 1 1/2 cups. I made this soup exactly as recipe states, and it was delicious. We will be making again! Perfect!! So glad you found this one (and soup for breakfast is always a good idea 😉 ). Tried it today, it is fantastic!!! I am a Tomato soup fanatic born and raised in Europe and wanted a different recipe. We all loved it!! Thank you ! This was delicious! I added a few sun dried tomatoes, and a pinch of chilli flakes. The family gave it a firm thumbs up! This soup is absolutely delicious and I didn’t even follow the recipe exactly nor did I use any special tomatoes! I was in a rush so I roasted the onions along with the tomatoes and garlic and then followed the rest of the steps. Absolutely one of the best tomato soups I’ve ever had! Really easy and guaranteed delicious. The soup is delicious with some additional herbs as well, particularly if you add thyme while roasting the tomatoes. Highly recommend! Perfect! This is one of those soups that’s great for customizing, too. Glad you enjoyed! This soup is absolutely delicious! I mean you don’t want to stop eating it. My daughter, who is 41 and has never liked tomato soup, begs me to make this. Whenever I am given a lot of tomatoes I know exactly what I’m going to do with most of them. I actually used cherry tomatoes the last time because I was given a huge amount of them. Also, this soup freezes well, so you can save some for another day. Thank you so much for this recipe. So happy to hear that, Terri! Perfect way to use up tomatoes (even in the summer).